The copper urine test is performed by collecting urine at specific times for a 24-hour period. 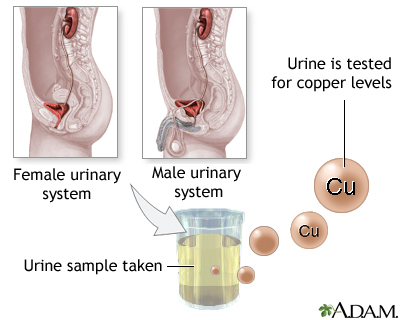 The urine is tested for the amount of copper present. The copper urine test is used to determine the presence of Wilson disease, a sometimes fatal condition in which the buildup of excess copper damages the liver, and eventually the kidneys, eyes and brain.